The number in the archive name is the revision number of the Subversion repository which matches that build. The VectorStorm test harness currently contains two simple games; ‘Asteroids’ and ‘StarShot’, and a few other technology demos. 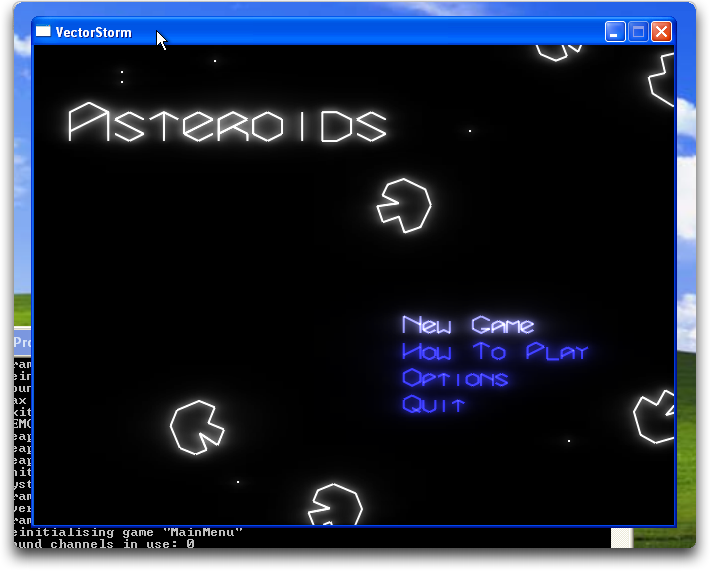 Asteroids is a basic implementation of the classic vector graphic game created by Atari in 1979. Shoot asteroids to break them into smaller pieces, and eventually destroy the smallest pieces. Destroy everything in a level to move to the next level. Asteroids bounce off each other in physically-correct ways. Difficulty level does not increase as you progress through levels. Asteroids is a testbed for vector sprites, collision detection and response, physics integration, and the physics-based particle system. StarShot is a unique game very loosely inspired by Boom Boom Rocket. And more specifically, by the extreme delay between its release everywhere else in the world, and its eventual release here in Australia. This isn’t the first time that I’ve said “Well gee, if they won’t let me buy the game I want, I’ll just write it myself,” and I’m sure it won’t be the last. And I actually like StarShot’s design more, although I’ll confess that its song selection is rather limited. As in, only one song. But on the plus side, at least it’s Jonathon Coulton. StarShot is a one-button rhythm game, in which you must press the button in time with the music, when particular firework rockets reach their targets. This is very similar to the mechanic used in Boom Boom Rocket, except that where Boom Boom Rocket introduces difficulty by making you press the correct button when the firework reaches a stationary target, StarShot only has one button, but instead has the targets constantly in motion, swirling in the background so that you have to try to pick out the correct target for each firework. StarShot is a testbed for intensive immediate mode rendering, and synchronisation between game activity and the background music track. VectorPhysics is a simple physics playground. Draw in one of three colors, and the objects you draw have physics applied. There is no game here; just a fun toy. Draw with the white pencil to draw static objects. This is good for drawing ground, hooks, or anything else you want to support other things. Draw with the blue pencil to draw dynamic objects. These objects will fall, stack, and otherwise interact with the rest of the world. Draw with the yellow pencil to draw ropes. If you move your mouse over an object so that it hilites red, then right-clicking will remove that object. Or else, just let the object fall off the bottom of the screen and it’ll automatically be deleted. All VectorStorm games make an attempt to use a gamepad if you have one connected. If not (or if it doesn’t work for some reason), you can control the game using the arrow keys, the space bar as your “A Button”, and the alt or option key as your “B Button”. You may quit VectorStorm at any time by pressing ‘Esc’. You may return to the game selection screen at any time by pressing ‘Q’. Sound Effects: Various, primarily sourced from http://freesound.iua.upf.edu/. See the program docs for full details. VectorStorm uses OpenGL, SDL, SDL_Mixer, SDL_Image, Box2D, and GLEW.